Ceramic bearings were first employed as alternatives to polyethylene (PE) bearings in total joint arthroplasty about a decade after Sir John Charnley introduced the first durable total hip arthroplasty (THA) with a metal-PE articulation. Charnley’s approach was based on a metal stem bonded to bone with polymethylmethacrylate (PMMA) and an acetabular component made of ultrahigh-molecular-weight PE (UHMWPE). Microscopic particulate debris in the joint space from bearing wear has been shown to lead to periprosthetic inflammation, osteolysis, and implant loosening. Cross-linking can reduce the wear of UHMWPE, but it also compromises UHMWPE’s mechanical properties. Accordingly, there are concerns related to potential brittleness if UHMWPE implants are not positioned optimally. Also, the smaller particles generated from cross-linked UHMWPE may present an increased particulate load in vivo. Thus, the long-term outcomes of cross-linked UHMWPE are not yet known. Any technology that can reduce bearing wear rates in THA and total knee arthroplasty (TKA) can potentially decrease the morbidity and risks associated with premature revision surgery related to wear. Improved wear resistance also allows the use of large-diameter femoral heads in THA, leading to increased arc of movement and less risk of prosthesis dislocation. The ideal joint bearing for THA and TKA would be able to withstand high cyclic loading for several decades, without undergoing corrosion or fretting at modular metal tapers, and would possess proven biocompatibility and material stability in vivo, as well as ultralow wear rates. The search for the ideal total joint bearing has led to the development of ceramic bearings. Bearings made of ceramics (eg, alumina [aluminum oxide] and zirconia [zirconium oxide]) have been shown to possess extremely low wear properties that make them suitable for both THA and TKA. When compared to the most commonly used bearing couple in joint arthroplasty, which consists of cobalt-chrome (CoCr) metal alloy articulating against UHMWPE (see the image below), ceramic surfaces offer significant reductions in bearing wear rates. 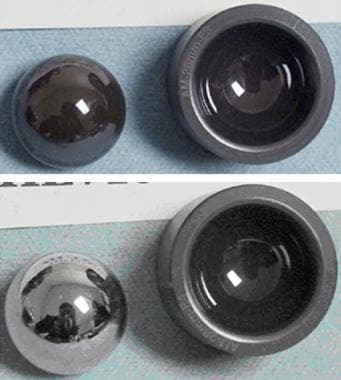 Prosthetic hip implants with ceramic-on-ceramic alumina bearing couple (left) and metal-on-polyethylene bearing couple (right). Metal-on-metal bearings also reduce THA wear dramatically, but metal wear particles can lead to delayed hypersensitivity reactions, and the long-term effects of systemically dispersed fine metal wear particles remain a matter of speculative concern. Currently, more than half a million total joint arthroplasties are performed annually in the United States, and this number is growing. Worldwide, by 2005, more than 5 million femoral heads and more than 500,000 acetabular components made of alumina had been implanted. Ceramic bearings are not as well accepted among US hip surgeons, because of concerns related to cost, complexity, lack of familiarity, and problems such as potential catastrophic rupture. At present, ceramic bearings are used in fewer than 10% of all THAs done in the United States. Ceramic technology continues to evolve, and new materials based on nonoxide ceramics, composites of existing ceramics, and surface modifications will offer more options to the arthroplasty surgeon. Previous experience has also shown that each new bearing technology applied to total joint arthroplasty can have unforeseen complications. [3, 4] Ceramics will continue to be developed for clinical use as the underlying engineering and material science principles of new materials are validated and as clinical data demonstrate their safety and reliability in vivo. High strength, a high elastic modulus, high fracture toughness, and high fatigue resistance are vital for materials used as articular surfaces in total joint arthroplasty, both to provide mechanical reliability and to resist deformation. These materials should also have high corrosion resistance for bioinertness and biocompatibility. Qualities such as high hardness and good surface finish are essential for long-term wear resistance and low friction in articular surfaces. A low contact angle provides good wetting and lubrication. Ceramics are crystalline structures in which the atoms are held together by strong ionic and covalent bonds. The strong atomic bonding gives these compounds their characteristic high compressive strength, hardness, and chemical inertness. Alumina and zirconia are oxidized ceramics (aluminum oxide [Al2O3] and zirconium oxide [ZrO2], respectively), and their high oxidation level renders them chemically inert, resistant to corrosion, and stable over the long term in vivo. These oxides have polar hydroxyl (-OH) groups that promote interaction with aqueous body fluids to provide a lubricating layer. The crystalline structure of alumina and zirconia also account for their characteristic brittleness, which is associated with low resistance to the propagation of cracks within the material. The brittle behavior of the ceramics is expressed as a low toughness value, which is lower than those of CoCr and titanium alloy. Ceramic bearings are made by heating fine particles or powders of the materials into a porous body of the desired shape, followed by heating to bond particles together (see the image below). The properties of the bearing are a function of the resulting microstructure. Schematic diagram showing steps in manufacturing ceramic femoral heads for total hip arthroplasty. 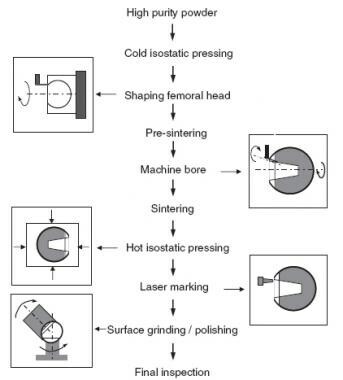 Process outlined is typical of third-generation alumina femoral heads (eg, BIOLOX forte; CeramTec, Plochingen, Germany). The microstructure of the bearing is determined by the nature, quality, and distribution of the material grains; the porosity within these grains; and manufacturing variables. Grain homogeneity, purity, and size consistency affect the mechanical properties of the bearing. Higher material density (lower porosity) and smaller grain size will result in superior mechanical properties and strength in the ceramic bearing. Performance also depends on fracture toughness and the design of the implant. Modern manufacturing methods, such as hot isostatic pressing, can produce ceramic bearings with near-zero internal porosity and with fine, uniformly sized grains distributed homogeneously throughout the material. The improved reliability of modern ceramics is largely due to improvements in raw materials, manufacturing processes, and implant design. Femoral components made of oxidized zirconium have been favored for total knee arthroplasty (TKA) in the United States. Catastrophic failure of an all-ceramic femoral component in TKA has yet to be reported. The brittleness of ceramics has led to unexpected catastrophic failure of femoral heads in vivo. Microscopic flaws (eg, pores, notches, inconsistencies and scratches) can be introduced during ceramic fabrication or during surface-matching of the finished bearing. With repetitive loading, stress concentration at a material imperfection can start a crack that subsequently migrates, resulting in abrupt failure. In contrast, under similar conditions, metal surfaces undergo plastic deformation and dissipate the applied stress without catastrophic failure. Catastrophic ceramic bearing failure most commonly occurs in the absence of any identifiable risk factor. Patient obesity, strenuous activity, and trauma have been listed as possible risk factors for the failure of ceramic femoral heads, but these variable loads are well below the fatigue limit of ceramics. 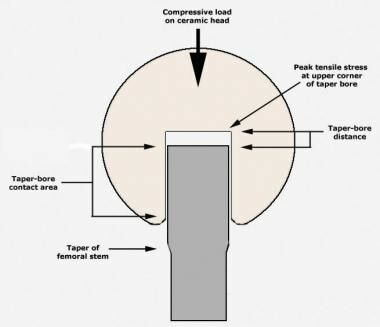 Compressive loads are well tolerated by ceramic bearings, but tensile stress can develop inside the taper bore of a femoral head and result in catastrophic failure. It has been experimentally and clinically demonstrated that tensile loads may be stored as hoop stresses within ceramic femoral heads, leading to delayed failure. Such failures possibly occur because of microscopic damage and stress retention in the bearing, with failure occurring when the internal material stress exceeds its fracture strength. Ceramic femoral heads can survive multiple forceful impactions on a metal trunnion without apparent damage, with fragmentation encountered only after a delay. In alumina acetabular inserts, tensile forces can develop if an eccentrically seated insert is impacted into a metal acetabular shell, resulting in chipping of the insert edge. There are a number of design variables that can affect tension between the femoral head and the stem taper in total hip arthroplasty (THA; see the image below). Modular junction between femoral head and stem taper in total hip arthroplasty, showing design variables that affect clinical outcomes. In articulations between ceramic and ceramic and between ceramic and ultrahigh-molecular-weight polyethylene (UHMWPE), in vivo failure can result from fracture of the ceramic femoral head, fracture of the acetabular liner, or wearthrough and fracture of the UHMWPE acetabular liner. Surgeons must be accurate when inserting the acetabular ceramic liner. Even a malalignment of 5° may result in chipping and cracking of the ceramic. In minimally invasive procedures, this 5° malalignment figure may even be more relevant. The combination of a high patient body weight, extensive range of motion, and subluxation of the femoral head can led to high friction at the articulation between the femoral head and the rim of the liner, which initiates displacement of the ceramic liner. Subsequent normal gait leads to further displacement of the liner and eventually causes ceramic liner fracture. The rate of alumina liner damage during surgery, as reported to one manufacturer (CeramTec, Plochingen, Germany), was 0.022% in 2000 and had declined to 0.008% by 2004. The risk of alumina femoral head failure declined from 2% in the 1970s to 0.1% in 1980s and to 0.05% in 1990s. Clinical trials in the United States that began in the 1990s have not yet reported any femoral head failures in vivo. Revision hip arthroplasty after a primary hip replacement with ceramic bearings is potentially a large problem. Allain et al reported a 5-year survival rate of 63% for revision following fracture of a ceramic femoral head. Any ceramic debris remaining after revision surgery acts to produce third-body wear. If a standard metal-on-polyethylene bearing is used in such a revision, there will be very high levels of third-body wear on the polyethylene, with subsequent osteolysis. Even with metal-on-metal bearings, there are concerns regarding metallosis. Some surgeons advocate using only ceramic-on-ceramic bearings in such revisions. A revision with simple exchange of bearing surfaces for well-fixed components will probably not be possible if ceramic bearings are to be used at the time of revision. Audible squeaking is a rare problem in THAs with hard-on-hard bearings such as ceramic-on-ceramic or metal-on-metal. The origin of the squeaking sound is multifactorial. One factor is acetabular cup orientation; another is that patients with squeaking hips reportedly tend to be younger, heavier, and taller than patients with silent hips. The hips start squeaking after an average of 14 months. Hips that squeaked with walking had more anteverted acetabular components than those that squeaked with bending or prolonged walking. Improvements in implant design have overcome some of the limitations of ceramic implants. The junction between the femoral head and the femoral stem critically affects the performance of ceramic femoral heads. The taper material bore depth, the contact area between the bore and the taper, the trunnion-bore distance, and the chamfer at the base can all affect the clinical outcomes of ceramic head. Tensile stresses can concentrate at the upper bore corner and can be reduced by increasing the ceramic-metal contact area, increasing the trunnion-bore distance, and centering the contact area on the bore. Thus, different prosthetic neck lengths in a ceramic femoral head can have varying effects on the risk of catastrophic fracture in vivo. The tapers on modern femoral stems are optimized to fit ceramic femoral heads and avoid stress risers at the taper-bore junction. The Morse tapers optimized for ceramic femoral heads typically have a number of peaks and valleys on the taper surface that are designed to flatten during head impaction, absorbing the applied loads and avoiding stress concentration. Ceramic femoral heads should be implanted on a clean, unused, and undamaged metal taper. Scratching, taper corrosion, or material caught between the taper and head can lead to stress concentrations and increase the risk of ceramic failure. Alumina (aluminum oxide [Al2O3]) is the most commonly used ceramic bearing material in total hip arthroplasty (THA). Pure alumina has a very low coefficient of friction, making it an appropriate choice for an orthopedic bearing surface. Alumina has proven biocompatibility, and in vivo aging does not affect its material properties. When used in alumina-PE THA articulations, alumina femoral heads reduce polyethylene (PE) wear rates; when used in alumina-alumina THA articulations, they can eliminate PE wear entirely. The role of improved materials, implantation techniques, manufacturing variables, and implant design in reducing the risk of catastrophic failure of ceramic bearing is best illustrated in the development of alumina femoral heads. The risk of catastrophic failure of a femoral head (eg, BIOLOX forte; CeramTec, Plochingen, Germany) is estimated to be between 1/25,000 (0.004%) and 1/10,000 (0.01%). The risk of other adverse outcomes associated with routine THA (eg, infection, dislocation, revision, and venous thrombosis) is much higher than that of alumina bearing failure. Zirconia (zirconium oxide [ZrO2])-based ceramics have 2 to 3 times more flexural strength and fracture toughness than alumina-based ceramics do and thus are among the most fracture-resistant ceramics available. They were introduced to reduce the risk of catastrophic failures with alumina heads while retaining superior wear properties. However, pure zirconia is not used as a bearing material, because it is unstable: it transforms from one form to another, and the shape and volume changes render it vulnerable to cracking. Phase transformation of zirconia can be controlled by adding stabilizing materials such as magnesia (magnesium oxide [MgO]), quicklime (calcium oxide [CaO]), and yttria (yttrium oxide [Y2O3]). This process is called transformation toughening. Controlled phase transformation has been used to develop different zirconia compositions for orthopedic bearings, such as tetragonal zirconia polycrystal (TZP), partially stabilized zirconia (PSZ), and zirconia-toughened alumina (ZTA). TZP is the strongest and toughest of zirconia-based ceramics, with optimal material density, fine grain size, and no strength-limiting flaws. Catastrophic wear is a possibility with zirconia-alumina and zirconia-zirconia bearing couples. Yttria-stabilized TZP (Y-TZP) femoral heads have been approved for use with PE or cross-linked PE (XLPE) acetabular inserts in THA to reduce wear. However, Y-TZP has 2 major practical drawbacks: (1) instability that leads to uncontrolled phase transformation and cracking in the heat and moisture of autoclave conditions and (2) time-dependent degradation of the material even at physiologic temperatures. In theory, these adverse properties can be controlled by modifying the grain size and powder composition; in practice, the multiple uncontrolled variables of the in vivo environment can lead to catastrophic failure of Y-TZP femoral heads. A single change in the manufacturing process of commercial Y-TZP femoral heads led to unexpectedly high premature failure rates and, ultimately, to the withdrawal of all Y-TZP from orthopedic applications. Partially stabilized zirconia (PSZ) usually contains magnesia as the stabilizing additive (ie, Mg-PSZ). Mg-PSZ was among the first zirconia ceramics introduced in the United States because of its toughness and smooth surface. 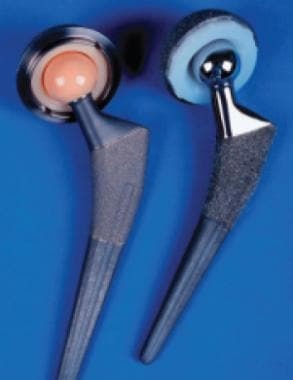 Mg-PSZ ceramic femoral heads are available in the United States for ceramic-PE articulations (eg, from BioPro, Port Huron, MI), but their use is not widespread. Unlike Y-TZP, Mg-PSZ is resistant to strength degradation in a moist environment, even at autoclave temperatures. Specimens retrieved from THAs have also shown that femoral heads made of Mg-PSZ do not undergo phase transformation in vivo. However, clinical data with Mg-PSZ are sparse, and the grain size distribution and mechanical properties of Mg-PSZ are typically inferior to those of well-fabricated Y-TZP in the absence of any material degradation. ZTA is a two-phase material made of zirconia particles dispersed in a dense, fine-grained alumina matrix. It has the hardness of alumina, with improved strength and fracture toughness, and is less susceptible to material degradation than Y-TZP is. Hip simulator tests have shown lower wear rates for ZTA-ZTA THA couplings than for alumina-alumina couplings. However, the clinical data on ZTA are insufficient to establish an advantage over alumina, and experimental aging of ZTA in Ringer solution has been associated with material degradation and reduction in material strength. ZTA can be further modified by adding materials such as strontia (strontium oxide [SrO]) and chromia (chromium [III] oxide [Cr2O3]) to fabricate an alumina matrix composite (AMC). These additives react with the alumina matrix to create elongated grains that add strength by providing an additional barrier to crack propagation. Hip simulator testing has shown that the wear rate of AMC-AMC THA couplings is less than those of ZTA-ZTA, alumina-alumina, and even AMC-alumina couplings. Biocompatibility tests have shown that AMC is inert. THA bearings made from AMC are marketed under the brand name BIOLOX delta (CeramTec, Plochingen, Germany). Early trials suggest that BIOLOX delta femoral heads may be suitable for articulation against cobalt-chromium (CoCr) acetabular inserts in THA, eliminating the risk of ceramic liner chipping. In addition, large-diameter AMC femoral heads can reduce the risk of catastrophic failure and THA dislocation. Because AMC is relatively new, its reliability is unknown, and any advantages over the more widely used BIOLOX forte alumina bearings are unclear. Silicon carbide (SiC) and silicon nitride (Si3 N4) are nonoxide ceramics. Compared with alumina, silicon carbide has increased strength and hardness and comparable fracture toughness. However, its corrosion and wear behavior in the physiologic environment are unknown. Because its fracture toughness is similar to that of alumina, pure silicon carbide probably has no particular advantage over alumina. Silicon nitride, on the other hand, has material properties that are compatible with orthopedic bearings. Material testing of silicon nitride composites has shown them to have 50% more strength and fracture toughness than current ZTA and AMC devices, and wear tests with this material have shown excellent wear characteristics (see the image below). Silicon nitride bearings before (top) and after (bottom) 1 million wear cycles. The mechanical and wear properties of silicon nitride could allow CoCr-ceramic couplings in THA, combining the safety and advantages of CoCr femoral heads with lower wear rates. Experimental wear rates of silicon nitride ceramic-ceramic and ceramic-CoCr couplings are similar to those of alumina THA bearings. Long-term in vivo exposure to silicon nitride does not lead to toxicity, mutagenicity, allergenicity, or carcinogenicity. Silicon nitride bearings for arthroplasty applications are being investigated by Amedica Corporation (Salt Lake City, UT) and may offer additional bearing options in the future. The wear properties of metal can be improved by depositing hard materials on the metallic surface as a coating. The techniques used to accomplish this have included nitrogen ion implantation, thermal diffusion, and vapor deposition of a nitride coating. Many of these wear strategies have not proved viable in clinical applications. For example, whereas titanium nitride coatings improve the hardness and wear characteristics of metal bearings, their performance under critical stress conditions in vivo is unpredictable. Applying thin diamondlike carbon coatings to femoral heads is another material technology that could improve the wear performance of metal bearings. Amorphous diamond coatings have advantageous properties, such as low friction and high resistance to wear and corrosion; such coatings are also resistant to surface abrasion. Although experimental data are encouraging, the performance of diamond-coated metal bearings in vivo is still unknown. Bearings with thin diamond coatings are being developed and tested for clinical trials by Diamicron (Orem, UT). Surface transformation of metal to oxidized zirconium is another method of reducing polyethylene (PE) wear in total hip arthroplasty (THA) and total knee arthroplasty (TKA). A wrought zirconium alloy (zirconium with 2.5% niobium) is oxidized by thermal diffusion to create a 5-µm oxidized zirconium layer at the articulation (Oxinium; Smith & Nephew, Memphis, TN). The surface oxide represents a transformation of the metal into zirconium oxide ceramic, which can be polished to a smooth surface. Compared with other surface modification technologies, the oxidized zirconium layer has excellent cohesion and adhesion, and it generates less wear against PE than CoCr does. A major advantage of this approach is the interchangeability of femoral heads during revision surgery, without the need for concern about the brittleness of a ceramic bearing. Limitations of this technology include the relatively modest reduction in PE wear rates and the susceptibility to scratching, both of which may be related to the surface oxide’s lower surface hardness in comparison with alumina. Particulate wear generated by ceramic-on-ceramic bearings can be further reduced by using ceramic with ultrafine or nanoscale grain sizes—or, better still, ceramic nanocomposites. Strength, hardness, fracture toughness, and wear resistance are improved with reduced grain sizes, particularly sizes in the nanoscale range. Alumina–silicon carbide nanocomposite has superior wear properties. Alumina-zirconia, alumina-titania (titanium [IV] oxide [TiO2]), zirconia-alumina, and silicon nitride–silicon carbide nanocomposites are under investigation. In general, ceramic bearings are indicated for total hip arthroplasty (THA) and total knee arthroplasty (TKA) in inflammatory and noninflammatory degenerative joint diseases such as osteoarthritis, posttraumatic arthritis, or secondary arthritis and avascular necrosis. Today, given the state of technology regarding ceramic bearings, their advantages, and their disadvantages, most surgeons use specific indications when choosing ceramics. Along with metal-on-metal bearings, ceramic bearings are referred to as alternative bearings or hard bearings. The advantage of such bearings is that they remove polyethylene (PE) from the articulation entirely, thereby eliminating PE wear debris as a potential source of wear-related problems in the long term. The only rationale for using such bearings in hip surgery is to increase the longevity of the arthroplasty, while allowing an active lifestyle for the patient. In making this choice, the surgeon has to consider the limitations of the bearing system as well. It follows that ceramic bearings generally are not indicated for elderly and infirm patients, whose longevity or activity level is limited. These patients will derive no particular benefit from a ceramic bearing system and are better suited for a traditional metal-polyethylene bearing couple, which almost certainly will outlast them. Again, there is no exact age or activity cutoff; the decision depends on the surgeon’s judgment. In some patients, sizing considerations may necessitate the use of an acetabular component with a relatively small diameter. For such patients, a large-diameter ceramic femoral head may not be an option. Large-diameter femoral heads reduce the risk of hip dislocation and are favored in modern hip surgery. However, because of design limitations related to material properties, ceramic bearings are available in only a limited range of femoral neck lengths and head diameters; thus, a surgeon choosing a larger-diameter femoral head may have no choice but to use a metal head. Likewise, ceramic acetabular inserts are not yet available in constrained designs; if a particular patient presents concerns related to hip stability, ceramic bearings may be contraindicated. Ceramic bearings are contraindicated in foreign body sensitivity, obesity, infection, sepsis, osteomyelitis, osteoporosis, and osteomalacia. Certain types of pelvic anatomy may preclude the use of standard hemispherical acetabular components, in which cases ceramic bearings may not be usable. In cases of known hip instability, ceramic bearings are generally contraindicated, because recurrent hip dislocations with ceramic femoral heads can lead to metallosis and wear debris accumulation. In revision THA, ceramic femoral heads should not be used on existing tapers on which a femoral head previously has been impacted. The risk is that the taper has already been deformed microscopically, and unless the new femoral head mates perfectly with the used taper, there is a risk of focal stress concentrations that may result in femoral head failure. Whenever a ceramic bearing is used, it is vital to ensure that the taper is designed to accept that particular bearing; mixing and matching of components between manufacturers should be avoided. Tolerances are significantly tighter with ceramics than they are with metals, and modern taper systems are optimized for use with specific ceramic bearings. Accordingly, the surgeon must be aware of the nature of the taper on which the ceramic bearing will be placed. The standard laboratory studies pertaining to arthroplasty surgery are indicated for patients who are scheduled to undergo a joint replacement procedure involving ceramic bearings. No additional laboratory data are necessary. High-quality images of the joint in at least two planes must be obtained before a major arthroplasty. In addition, if there is any question about bone deficiency in the acetabulum (as in cases of posttraumatic arthrosis or developmental hip dysplasia), additional imaging (eg, computed tomography [CT] or Judet views of the pelvis) may be indicated. In such cases, it may be necessary to employ additional modular options or special configurations of metal implants that preclude the use of ceramic bearings. As with all joint replacement procedures, proper preoperative templating is essential. With ceramic bearing implantation, such templating is even more important because ceramic bearings are still limited in terms of sizing and modularity. For certain sizes of acetabular components and femoral stems, no suitable ceramic bearing may be available. Because ceramics are bioinert and are well tolerated by the body without adverse reactions, no specific patient testing is needed before implantation of a ceramic bearing in a total hip or knee replacement. Before any arthroplasty, regardless of whether the use of ceramic bearings is contemplated, appropriate conservative therapy with exercise, lifestyle modification, and medical management is indicated. In morbidly obese patients for whom the risk of ceramic bearing rupture may be a theoretical concern, weight reduction should precede any elective operation. The surgical anatomy and the operative approaches used for arthroplasty are essentially the same for ceramic bearings as they are for standard metal-polyethylene bearings. There is, however, a relevant caveat of which the surgeon must be aware. Because minimally invasive surgical approaches to hip replacement limit surgical exposure and visualization, the use of alternative bearings such as ceramics should be approached with caution when a minimally invasive procedure is being planned. Specifically, if a ceramic bearing is not seated correctly because of limited surgical exposure, or if the metal components to which the bearing is mounted are not aligned within accepted limits, early failure may be inevitable. Ceramic bearings are much less forgiving of component malpositioning and incomplete bearing seating than polyethylene bearings are. This consideration must be kept in mind by any surgeon contemplating the use of ceramic bearings in a minimally invasive arthroplasty. Similarly, installation of a ceramic liner is different from installation of a polyethylene (PE) liner. Alumina liners must be perfectly aligned with the metal cup before final impaction; any eccentric loading during impaction may result in a chipped liner that cannot be reused. Excessive impaction of the metal cup into sclerotic bone that has not been reamed sufficiently can slightly deform the titanium metal shell during seating in the pelvis; if this occurs, the ceramic liner may not seat properly, and a PE liner may have to be used instead. Finally, reduction of the alumina head into the liner should be done carefully. Inadvertent contact between the head and the metal shell rim can lead to streaks and metal-staining on the head; these will increase the wear of a PE liner. Whenever possible, the largest suitable femoral head should be used, with special care taken to optimize component positioning. Edge loading of a vertically placed cup will lead to stripe wear, possible squeaking of the bearing, and rapid wear. Component malpositioning can also lead to hip instability and dislocation, which can damage the smooth surface of the ceramic head, thus resulting in component damage and rapid wear. With modern total joint replacement approaches, patients are encouraged to mobilize much earlier, with fewer precautions; consequently, hospital stays tend to be shorter. Some of the accelerated recovery is attributable to modern anesthetic and analgesic protocols. Stitches or staples are removed about 10-14 days after the procedure. Postoperative exercise or physiotherapy is critical for good outcomes. Patients should be able to resume normal activities within 3-6 weeks after the operation. Assistive aids should be used as necessary during the first 2 weeks to prevent falls. In some cases, such aids may have to be used for a longer period to ensure patient safety. Catastrophic failure of an all-ceramic femoral component in a total knee arthroplasty (TKA) has yet to be reported. Clinical trials in the United States that began in the 1990s have not reported an in vivo failure of a femoral head. Murphy et al, in a study of the 2- to 9-year results of alumina ceramic-on-ceramic THA, reported that implant survivorship for all hips with aseptic revision of any component was 96% at 9 years, whereas survivorship for hips without previous surgery was 99.3%. The incidence of implant-related complications was 1.7%. D’Antonio et al, describing the 5-year results of a prospective randomized study comparing alumina ceramic bearings with cobalt-chrome (CoCr)-on-polyethylene (PE) bearings, reported that revision for any reason occurred in 2.7% of the patients with alumina bearings and 7.5% of those with CoCr-on-PE bearings. Osteolysis was reported in 1.4% of the patients with alumina bearings and in 14.0% of those with CoCr bearings. Ceramic bearings had fewer revisions and less osteolysis, and they had no failures at an average follow-up of 5 years. D'Antonio J, Capello W, Manley M, Naughton M, Sutton K. Alumina ceramic bearings for total hip arthroplasty: five-year results of a prospective randomized study. Clin Orthop Relat Res. 2005 Jul. (436):164-71. [Medline]. Kang BJ, Ha YC, Ham DW, Hwang SC, Lee YK, Koo KH. Third-generation alumina-on-alumina total hip arthroplasty: 14 to 16-year follow-up study. J Arthroplasty. 2015 Mar. 30 (3):411-5. [Medline]. Tai SM, Munir S, Walter WL, Pearce SJ, Walter WK, Zicat BA. Squeaking in large diameter ceramic-on-ceramic bearings in total hip arthroplasty. J Arthroplasty. 2015 Feb. 30 (2):282-5. [Medline]. Aoude AA, Antoniou J, Epure LM, Huk OL, Zukor DJ, Tanzer M. Midterm Outcomes of the Recently FDA Approved Ceramic on Ceramic Bearing in Total Hip Arthroplasty Patients Under 65 Years of Age. J Arthroplasty. 2015 Aug. 30 (8):1388-92. [Medline]. Allain J, Roudot-Thoraval F, Delecrin J, Anract P, Migaud H, Goutallier D. Revision total hip arthroplasty performed after fracture of a ceramic femoral head. A multicenter survivorship study. J Bone Joint Surg Am. 2003 May. 85-A(5):825-30. [Medline]. Koch CN, Figgie M Jr, Figgie MP, Elpers ME, Wright TM, Padgett DE. Ceramic Bearings with Titanium Adapter Sleeves Implanted During Revision Hip Arthroplasty Show Minimal Fretting or Corrosion: a Retrieval Analysis. HSS J. 2017 Oct. 13 (3):241-247. [Medline]. Hernigou P, Roubineau F, Bouthors C, Flouzat-Lachaniette CH. What every surgeon should know about Ceramic-on-Ceramic bearings in young patients. EFORT Open Rev. 2016 Apr. 1 (4):107-111. [Medline]. Bedard NA, Burnett RA, DeMik DE, Gao Y, Liu SS, Callaghan JJ. Are Trends in Total Hip Arthroplasty Bearing Surface Continuing to Change? 2007-2015 Usage in a Large Database Cohort. J Arthroplasty. 2017 Aug 3. [Medline]. Hamadouche M, Boutin P, Daussange J, Bolander ME, Sedel L. Alumina-on-alumina total hip arthroplasty: a minimum 18.5-year follow-up study. J Bone Joint Surg Am. 2002 Jan. 84-A(1):69-77. [Medline]. Yeung E, Bott PT, Chana R, Jackson MP, Holloway I, Walter WL, et al. Mid-term results of third-generation alumina-on-alumina ceramic bearings in cementless total hip arthroplasty: a ten-year minimum follow-up. J Bone Joint Surg Am. 2012 Jan 18. 94 (2):138-44. [Medline]. Lau YJ, Sarmah S, Witt JD. 3rd generation ceramic-on-ceramic cementless total hip arthroplasty: a minimum 10-year follow-up study. Hip Int. 2017 Jul 29. [Medline]. Murphy SB, Ecker TM, Tannast M. Two- to 9-year clinical results of alumina ceramic-on-ceramic THA. Clin Orthop Relat Res. 2006 Dec. 453:97-102. [Medline]. Howard DP, Wall PDH, Fernandez MA, Parsons H, Howard PW. Ceramic-on-ceramic bearing fractures in total hip arthroplasty: an analysis of data from the National Joint Registry. Bone Joint J. 2017 Aug. 99-B (8):1012-1019. [Medline].